Over the years, many of the larger manufacturing facilities in the United States have developed some type of publication to keep their employees informed of business strategies and performance. These company newsletters were usually published quarterly or semiannually and sometimes also contained feature stories about employees, businesses, churches or other local items of interest. The North American Rayon Corporation and American Bemberg Company were no exception. Their very first publication debuted in July of 1929. Local documents show that the publication had several names over the years but always contained the name "Spinnerette" in the title. The publication started as a 4 page tabloid sized newsletter and was published weekly. The slogan of the paper was "Published by and for the employees of American Bemberg and the American Glanzstoff Corporation". The Spinnerette was published weekly and was originally printed at the Elizabethton Star. 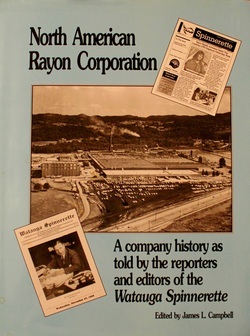 According to a locally written book entitled "North American Rayon Corporation" it is unclear as to the name that the first five issues of the company newspaper were printed under. The name "Watauga Spinnerette" appeared for the first time on August 27, 1929 as Volume 1 Number 6. Most people remember the publication as the "Watauga Spinnerette" and at its peak, over 6,000 copies were being printed and distributed every month to employees and residents of Elizabethton and Carter County. The publication's name was a result of a contest held for the employees of the two plants. They were to submit names that would reflect the area as well as the business. The winning name was the result of three different submissions that were combined to make the "Watauga Spinnerette" the official name. The three winners had to split the $25 prize. After 8 more issues were printed as a newspaper, the publication would take on a new form with the Volume 1 Number 14 issue which would be printed in magazine form. This issue was released on Wednesday, November 27, 1929 at which time the magazine would be printed bi-monthly. The next year the magazine would become the monthly publication that most people remember. The "Watauga Spinnerette" would continue to be published consistently until the early 1950's at which time it was only issued occasionally. With challenges such as ownership changes, reduced profitability of the rayon market, and the need to reduce cost, the magazine was sometimes the victim of budget cuts. It was still published sporadically during the next several years. The last issue was published sometime in the mid 1990's. The information that has been documented in "Watauga Spinnerette" has proven to be very valuable to this website. Several of our topics have been strongly based on articles from one of the few "Spinneret's' that the CCH staff has been able to obtain. We have been able to purchase a couple of issues on ebay and have been fortunate enough to receive a couple of privately owned copies by local residents. Several copies of the Spinnerette lie in the attics and closets of homes in the county. If you would be interested in donating or even selling copies of the Spinnerette to cartercountyhistory.com, we would be more than happy to talk with you. We are working with Joseph Penza at the Elizabethton Public Library Archives Department to build a collection of Spinnerettes for future reference. Lastly, if you would like more information on the "Spinnerette" as well as a collection of key articles that the magazine contained, I highly recommend the book "North American Rayon Corporation, A company History" for your collection. This book was edited by local resident James "Jamie" Campbell and has several interesting photos and articles from the "Watauga Spinnerette".